The red version of this shirt was debuted back in S3, but we don’t see this blue version until S4. This shirt has broad stripes in grey and blue. It does up with diamond snaps. The breast pocket flaps are double peaked with two diamond snaps each. In Are You There God? It’s Me, Dean Winchester (4x02), Sam wears it from the beginning of the episode until he goes to sleep after Bobby successfully completes the spell that saves the day. In After School Special (4x13), Sam wears it when he and Dean go to see Dirk McGregor Senior. He keeps it on until they put Dirk’s ghost to rest. In Fallen Idols (5x05), Sam wears it when he and Dean are researching on their laptops after the Abraham Lincoln murder. He wears it until he is attacked by Ghandi. 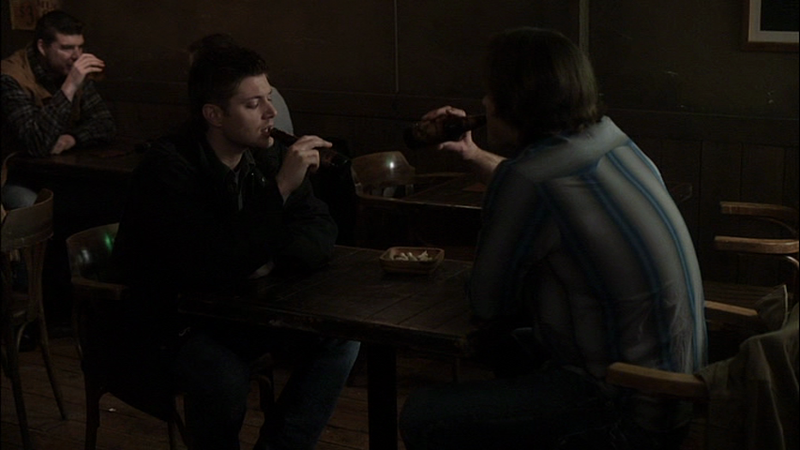 In Abandon All Hope (5x10), Sam wears it from the beginning of the episode until the party at Bobby’s place. In 99 Problems (5x17), Sam changes into it at some point during their drive into Blue Earth, MN, after they are rescued by the Sacrament Lutheran Militia. He wears it until the kid, Dylan, is killed after the demon hunt. In Live Free or Twi-Hard (6x05), Sam wears this shirt from the beginning of the episode until after they investigate the missing girl’s room and laptop. 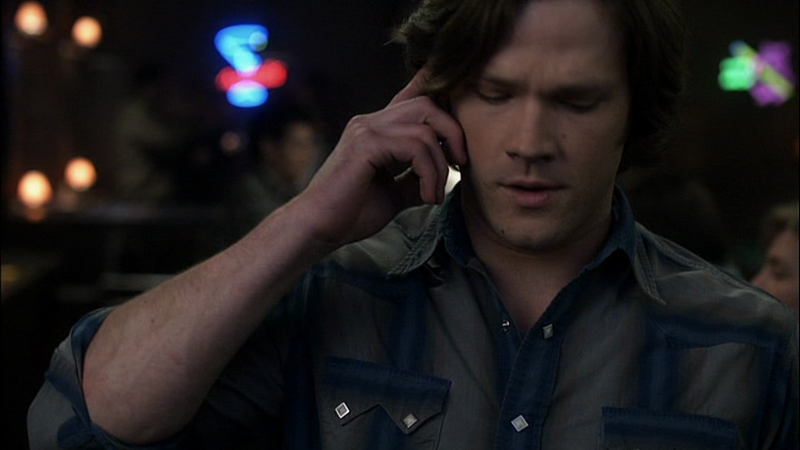 In Like A Virgin (6x11), Sam wears this shirt when he and Dean get back to the motel after interviewing the girl in the hospital, and Sam floats the idea that they might be hunting dragons. In Frontierland (6x18), Sam is wearing this shirt at Bobby’s, when Dean comes back with their 1861 disguises and forces Sam to change. In Season 7, Time for a Wedding (7x08), Sam is wearing this shirt when Dean shows up at Becky’s apartment with a waffle-iron. He wears it until Becky knocks him unconscious, except for a brief period of time when he wears a suit while investigating. In The Born-Again Identity (7x17), Sam wears this shirt at the end of the episode when he leaves the hospital. In Hunteri Heroici (8x08), Sam wears this shirt at the end of the episode when they leave Castiel to look after Fred for a few days. In The Great Escapist (8x21), Sam wears this shirt after his ice bath when he leads Dean to Metatron’s room. He wears it for the remainder of the episode. In About a Boy (10x12), Sam wears this shirt at the beginning of the episode when he comes into Dean’s room and tells him about the case and then persuades him to leave the Bunker.